04 SepNavigating Mid-Term ­Elections: Smooth Sailing or Choppy Waters Ahead? Today’s political environment is anything but ordinary, but with the major indices hitting new record highs in the U.S., it’s safe to say that the markets have been remarkably resilient in the face of uncertainty surrounding recent geopolitical events and the upcoming mid-term elections. The U.S. equity markets have climbed the “wall of worry” very well and sit poised for continued gains. But what else should investors expect ahead of this year’s mid-term elections? Historically, the President’s party has tended to lose congressional seats, especially in the House of Representatives, which is currently what the polls are suggesting. Dating back to the 1902 mid-term elections, the president has lost medians of 28 seats in the House and four seats in the Senate. Republicans have lost fewer seats than Democrats, and contrary to political lore, losses have been smaller for first-term presidents than second-term presidents. In the five cases of new Republican presidents, the Republican party lost a median of 18 seats in the House but gained one in the Senate. If historical precedent repeats, it would be enough for Republicans to maintain majorities in both the House and Senate. However, most polls have the Democrats picking up a majority in the House, with the Republicans holding onto the Senate. Polls are a funny thing though, and if recent elections are any indication, the polls may not be accurate. Polls on both Brexit and the 2016 U.S. Presidential Election were wildly off. As such, we think the likely results will be more uncertain than the polls suggest. In studying every mid-term election year dating back to the 1930’s, mid-term election years have typically experienced higher levels of market volatility compared to non-election years. A reason for this trend can be explained by the government typically removing stimulus during mid-term years. 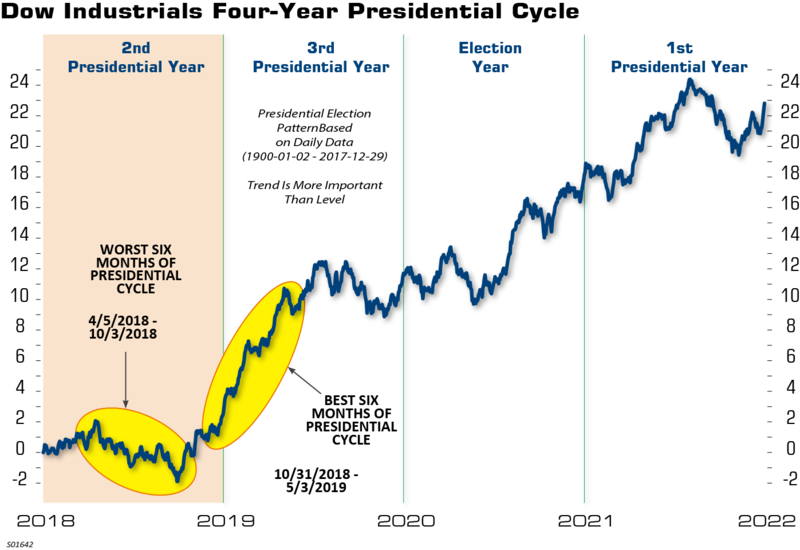 The normal pattern has been that stimulus is removed after the presidential election, through the post-presidential election year, and into the first half of the mid-term year. Stimulus has historically been pumped back into the economy starting late in the mid-term year, throughout the pre-election year, and well into the election year. However, current government stimulus has not followed the historical pattern this cycle. Fiscal policy has been expansionary with President Trump’s recent tax cuts and even though the Fed continues its path of rate hikes, they have hardly been restrictive. As shown in the chart below, we are currently in the worst six months of the presidential cycle—but it’s not all bad news for investors. In fact, history also shows us that the weakest six months of the presidential cycle are typically followed by the strongest. Since 1934, the average gain from the mid-term low to the high point in the following year is 47% and the average Post WWII gain for the S&P 500 in the mid-term election year is 6.7%, with a median gain of 11.4%. The market experienced a 10% correction in the first quarter of 2018 and while there’s a chance we’ve already experienced the normal mid-term market correction, it would not be surprising to see an additional correction or consolidation ahead of the elections. For investors, fundamentals are what matter in the long-run, and we believe current fundamentals remain positive. The Conference Board’s Leading Economic Indicator index recently hit an all-time high, and shows no signs of rolling over, which it has historically done about 11 months prior to a recession. Furthermore, weekly initial jobless claims are at their lowest levels since the late 1960s, reflecting strength in the job market, which is critical for a consumption led economy. Corporate earnings, which are a critical driver of stock prices, are growing at the strongest pace since 2010. Investors should remain positive on the U.S. economy, and expect the current economic expansion to continue and accelerate into 2019 with the odds of a recession this year very low. Recognizing that we are likely in the late cycle phase of the economic expansion, we believe the fundamental backdrop remains supportive for risk assets including equities and high yield bonds. While investors should expect some volatility ahead of mid-term elections, it’s important to let them know that any volatility we experience is likely to be short lived, and to stay focused on their long-term goals and objectives.